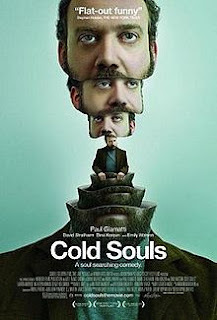 Paul Giamatti stars as an actor who puts his sou in storage in the hope of becoming a better actor. Things become complicated when it goes missing and he has to track it down. Giamatti rightly won a rave reviews for his performance in this off kilter film. He and the rest of the sterling cast make this film worth seeing even when the plot strains credulity. Yes I know the whole plot of soul swapping is off beat to begin with but one has to be careful in asking your audience to believe too much, and at times Sophie Barthes script does just that. On the other hand it's so nice to see an intelligent film that you're bound to be like me and cut the film some slack. Worth tracking don, especially if you really want to go off Hollywood.